How the other side lives. The United States may have the highest paid CEOs, but South Africa is where CEOs live far above the rest of us. South African CEOs are among some of the best paid in the world, and earn more than 500 times more than the average South African. The figures are the latest statistic illustrating how South Africa is consistently (pdf) one of the most unequal societies in the world. South Africa ranked seventh when counting CEO salaries around the world, according to a Bloomberg survey of executive paychecks around in the world’s 25 largest economies. But Africa’s most advanced economy rocketed to the top when considering how executive packages compared to the average income in the country. The average income in South Africa is $13,194, measured in GDP per capita adjusted to purchasing power in 2015 and 2016. 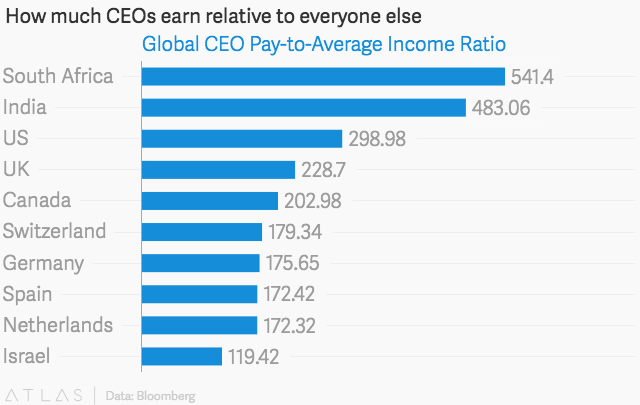 The average CEO earned $7.14 million, 541 times more than the average income. India ranked second in highest inequality with CEOs earning 483 times more than the average salary, at an average of $3.10 million. Poverty levels in India may be higher, but its inequality levels are much lower than South Africa. The US and UK also ranked high in the disparity between executive salaries and the average worker, but their ratio was around half of that of South Africa’s. 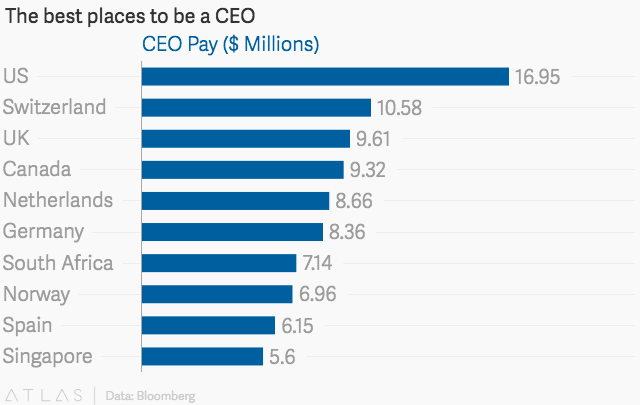 The ranking of CEO salaries found that American CEOs had the biggest paychecks, followed by CEOs in Switzerland and the UK. The ranking, showed the vast disparity between Americans and their Chinese counterparts, where the pay is 90% below the average. But heads of state owned companies in China do not necessarily disclose additional perks like housing and entertainment in public filings. The number of listed companies that were assessed could also influence the rankings data and the US is home to a large number of the world’s listed companies, according to Bloomberg. The CEOs salaries figures were gathered from public filings of listed companies and calculated according to salary, cash bonuses, pension, deferred pay, value of perquisites and non-cash remuneration such as equity awards.